I concocted the Love of my Life cocktail way back in January for the "Thinking of Summer" TDN, but it was one of the many drinks that got lost in the shuffle about which I never got around to posting. But now I've got a good excuse to reach back through the months to finally post this one, since it appeared in the July/August issue of Mutineer Magazine. I know, cool, right? You see, there is a sporadically appearing column put together by SeanMike Whipkey of Scofflaw's Den which highlight some of the drinks created over the last several Thursday Drink Nights, and this time a couple of mine made the cut. A couple? 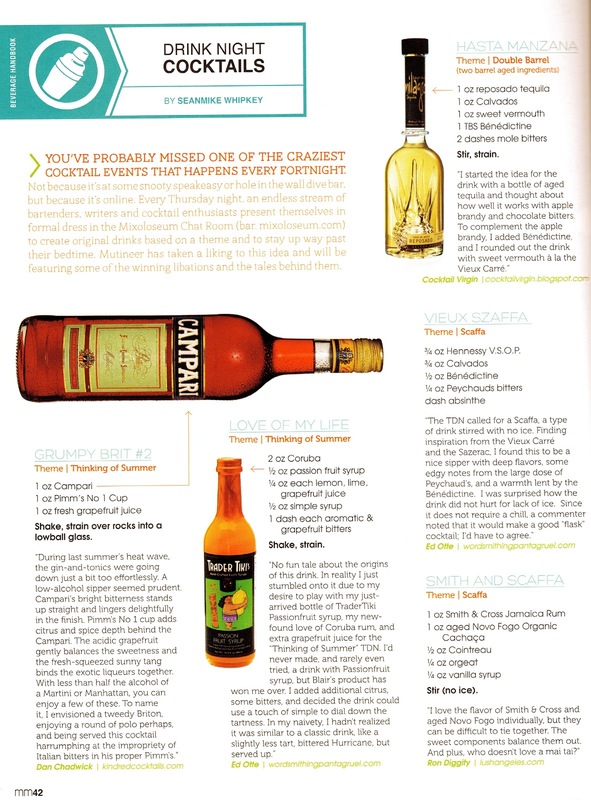 Yup, they saw fit to include my Vieux Szaffa as well, but I already posted that. I know it's hardly a big deal, but I got a kick out of seeing some of my drinks in shiny print, so thanks to the CSOWG and everyone over at the Mixoloseum for making TDN happen and SeanMike for the cat wrangling it takes to put up the column for Mutineer. Do go over and check out the magazine, you can find some fun stuff over there, and look out for the next Drink Night Cocktails column hopefully appearing in an upcoming issue. No fun tale about the origins of this drink. In reality I just stumbled onto it due to my desire to play with my just-arrived bottle of TraderTiki Passionfruit syrup, my new-found love of Coruba rum, and extra grapefruit juice for the "Thinking of Summer" TDN. I'd never made, and rarely even tried, a drink with Passionfruit syrup, but Blair's product has won me over. I added additional citrus, some bitters, and decided the drink could use a touch of simple to dial down the tartness. In my naivety, I hadn't realized it was similar to a classic drink, like a slightly less tart, bittered Hurricane, but served up.